დაცვის სტატუსი / Protection Status: ტერიტორიის 73,71%-ს IBA (GEO25) ფარავს. IBA-ს (GEO25) ტერიტორიის 39,83%-ს SPA 2 ფარავს. / 73.71% of territory is covered by IBA (GEO25). 39.83% of IBA (GEO25) is represented by SPA 2.
დასაცავი სახეობები / Species of concern: მცირე ჩვამა (Microcarbo pygmaeus), წითელი იხვი (Tadorna feruginea), ბექობის არწივი (Aquila heliaca), თეთრკუდა ფსოვი (Haliaeetus albicilla), სარსარაკი (Tetrax tetrax) და შავმუცელა გვრიტჩიტა (Pterocles orientalis). წითელი იხვი, სარსარაკი და შავმუცელა გვრიტჩიტა ალაზნის ველს სამიგრაციოდ იყენებენ. ალაზნის ველზე შემდეგი სახეობები ბუდობს: 1-2 წყვილი ბექობის არწივი; 1-2 წყვილი თეთრკუდა ფსოვი; 20-30 წყვილი მცირე ჩვამა. წითელი იხვი, ბექობის არწივი და სარსარაკი საქართველოს წითელ ნუსხაში შეტანილია როგორც მოწყვლადი (VU) სახეობები, თეთრკუდა ფსოვი – როგორც საფრთხეში მყოფი (EN). ბექობის არწივი IUCN-ის წითელ ნუსხაში შეტანილია, როგორც მოწყვლადი (VU) სახეობა, ხოლო სარსარაკი და თეთრკუდა ფსოვი – როგორც საფრთხესთან ახლოს მყოფი (NT) სახეობები. / Pygmy Cormorant (Microcarbo pygmaeus), Ruddy Shelduck (Tadorna feruginea), Eastern Imperial Eagle (Aquila heliaca), White-tailed Eagle (Haliaeetus albicilla), Little Bustard (Tetrax tetrax), Black-bellied Sandgrouse (Pterocles orientalis). 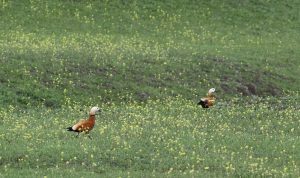 Ruddy Shelduck, Black-bellied Sandgrouse and Little Bustard use Alazani valley for migration. 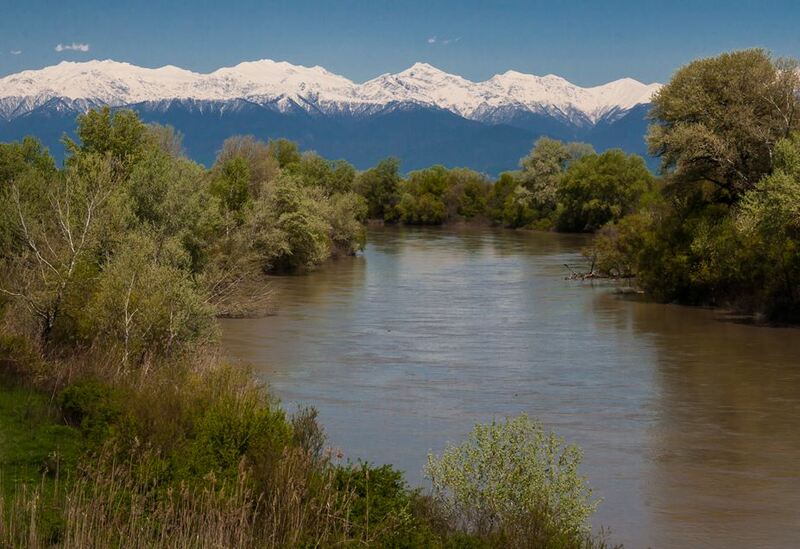 Following species of birds are breeding at Alazani valley SPA: 1-2 pairs of Eastern Imperial Eagle; 1-2 pairs of White-tailed Eagle; 20-30 pairs of Pygmy Cormorant. Ruddy Shelduck, Eastern Imperial Eagle and Little Bustard are included on the red list of Georgia as Vulnerable (VU) and White-tailed Eagle – as Endangered (EN). Eastern Imperial Eagle is also classified on the IUCN red list as Vulnerable (VU) and Little Bustard and White-tailed Eagle – as Near Threatened. ტერიტორიის აღწერა / Description of the site: SPA ალაზნის ველი საქართველოს აღმოსავლეთ ნაწილში ზღვის დონიდან 200 – 250 მეტრ სიმაღლეზე მდებარეობს. მდინარე ალაზნის გასწვრივ ჭალის ტყეები გხვდება, სადაც შემდეგი ძირითად სახეობებია წარმოდგენილი: ვერხვი (Populus canescens; Populus nigra), მურყანი (Alnus barbata), კუნელი (Crataegus kyrtostyla) და ლერწამი (Svida australis) (Kvachakidze 2010). ორნითოფაუნა იხილეთ http://aves.biodiversity-georgia.net / Alazani valley SPA is located in the eastern part of Georgia, at an altitude of 200 – 250 meters. Riparian forests are stretching along the river Alazani. Poplar (Populus canescens; Populus nigra), Alder (Alnus barbata), Hawthorn (Crataegus kyrtostyla), and Reed (Svida australis) (Kvachakidze 2010) dominate river Alazani riparian forests. See http://aves.biodiversity-georgia.net for Avifauna. მეთოდის აღწერა / Description: მობუდარი წყვილების დასათვლელად და ბუდობის წარმატების შესაფასებლად მინიმუმ ორი საველე ექსპედიციაა საჭირო. ექსპედიციის დროს ბუდეებს აღმოაჩენთ და თითოეულ ბუდეში ბარტყების რაოდენობას დაითვლით. აღრიცხვის თარიღს, ბუდეების GPS კოორდინატებსა და ბარტყების რაოდენობას ჩაინიშნავთ. მეორე ექსპედიციას ბუდობის წარმატების შესაფასებლად განახორციელებთ. ბარტყებს ხელმეორედ დაითვლით და იმავე ბუდეზე პირველი ექსპედეციის დროს აღრიცხული ბარტყების რაოდენობას შეადარებთ. სახეობები, ექსპედიციების დრო და საბუდარი ადგილების აღწერა იხილეთ ცხრილ 1-ში. 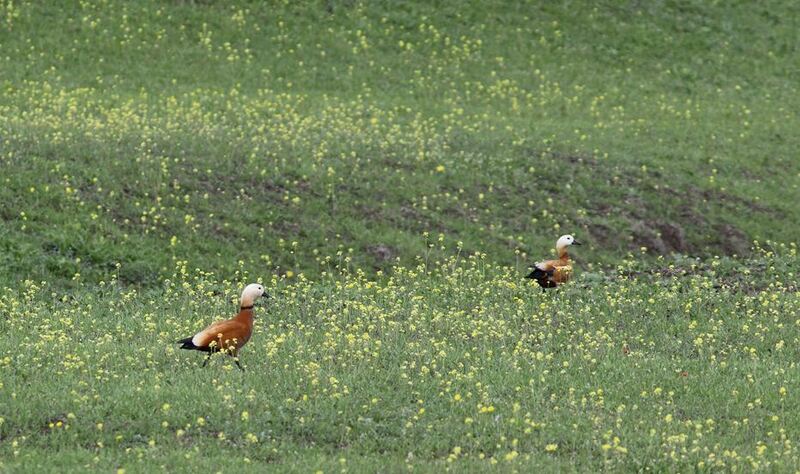 / At least two field expeditions are required to count nesting pairs and to assess breeding success. During the first expedition nests should be discovered and nestling should be counted. Date, GPS location of the nest and number of nestling should be recorded. During the second expedition, the breeding success should be assessed, by counting number of chicks in the same nests which were discovered during the first expedition. Species, expedition dates and nesting habitat description see in table 1. June მაღალი ხეები და კლდის გამონაშვერები / In high trees and ledges of cliff. საჭირო აღჭურვილობა / Needed Equipment: ტელესკოპი 20X60 გადიდებით შტატივთან ერთად; ბინოკლი 8X ან 10X გადიდებით; GPS; გასაბერი ნავი / 20X60 magnification spotting scope; 8X or 10X magnification binoculars; GPS; Inflatable boat. საჭირო აღჭურვილობა / Needed Equipment: მაღალი გამავლობის მანქანა; ტელესკოპი 20X60 გადიდებით შტატივთან ერთად; ბინოკლი 8X ან 10X გადიდებით; GPS / 4 wheel drive car; 20X60 magnification spotting scope; 8X or 10X magnification binoculars; GPS. მეთოდის აღწერა / Description: აღრიცხვებს ყოველ თვე, გაზაფხულსა და შემოდგომაზე ატარებთ. ტერიტორიის მაქსიმალურად დიდ ნაწილს მანქანით ფარავთ. პერიოდულად ჩერდებით, კარგი ხედვისთვის შემაღლებულ ადგილს ირჩევთ და მიმდებარე ადგილებს ტელესკოპითა და ბინოკლით ყურადღებით ათვალიერებთ. ამ სამი სახეობიდან ერთ-ერთის აღმოჩენის შემთხვევაში პირდაპირი დათვლის გზით აღრიცხავთ. / Counts should take place in every month in spring and in autumn. The whole territory should be covered using vehicle. For good visibility, fields should be scanned from elevated places using binoculars and scope. Already discovered bird flocks should be directly counted using spotting scope. Time, GPS coordinates and number of birds should be recorded.